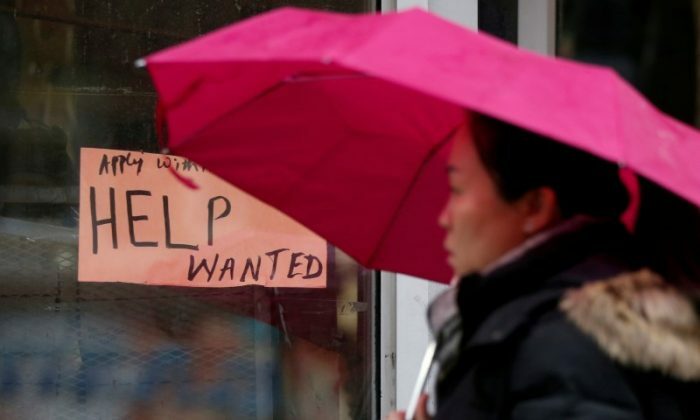 OTTAWA—The Canadian economy added 15,400 jobs in February after a big loss in January but full-time positions shrank and wage growth decelerated, prompting analysts to predict the Bank of Canada will be in no rush to raise rates. Statistics Canada said on Friday the unemployment rate dipped to 5.8 percent from 5.9 percent in January. Analysts in a Reuters poll had forecast employment would increase by 20,000 after Canada shed 88,000 positions in January, the most in nine years. The mixed nature of the data is likely to reinforce the Bank ofCanada’s cautious stance on interest rates after it stayed on the sidelines on Wednesday. “This is about as close to neutral a jobs report can get inCanada … It will keep (the Bank of Canada) with a tightening bias but with no urgency to move quickly,” said Doug Porter, chief economist at BMO Capital Markets. Bank of Canada Deputy Governor Timothy Lane said on Thursday the central bank is not on a preset course regarding interest rates, adding it will view future rate moves cautiously and assess incoming data. The Canadian dollar rose slightly to C$1.2835 to the U.S. dollar, or 77.91 U.S. cents, from C$1.2880, or 77.64 U.S. cents. Separately, data showed U.S. job growth surged in February, recording its biggest increase in more than 1-1/2 years. February’s gains in Canada were all in the part-time sector, which added 54,700 positions, while the full-time sector shed 39,300 jobs. Average hourly wages for permanent employees rose by 3.1 percent from last February, down from the 3.3 percent year-over-year increase in January. Andrew Kelvin, senior rates strategist at TD Securities, noted the loss of full-time jobs and slowing wage growth. “It was a little bit on the weak side and to us sits with a more gradual pace to tightening by the Bank of Canada,” he said by phone. On a year-over-year basis, employment rose by 282,500, or 1.5 percent, while the six-month average for employment growth was 19,000, down from 20,100 in January. Separately, Statscan said industrial capacity hit a 10-year high. Capacity utilization rose to 86.0 percent, the most since the 86.0 percent posted in the second quarter of 2007. Analysts in a Reuters poll had predicted a rate of 85.2 percent.